FELICIA WEBSTER is a performance poet born and raised in Omaha. She has performed in many different kinds of venues such as schools, nightclubs, community centers, and theaters. 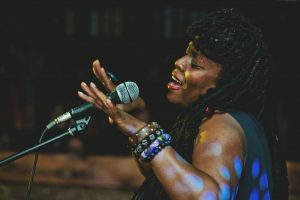 Her performances and presence in Nebraska have won her a number of awards including a Community Partnership Award from the Center for Holistic Development, Artist of the Year (In music & community), and Artist & Community Activist of the Year. Felicia’s performances blend rhythmic spoken word in with singing and beat-boxing. She supports the Omaha community by hosting public speaking events. As an artist, she avoids the title of slam poet preferring not to sequester herself to one type of performative event, and she encourages those introduced to slam poetry to craft a voice of their own since it is the message of the words that really matters. Wielding a Master’s degree in Early Childhood Education, Felicia also puts her understanding of the abstract to work as a teacher. For her work as a teacher she has been honored as Teacher of the Year at Creighton University Upward Bound and Teacher of the Year at McMillan Magnet. For more information about Felicia and her performances, check out her personal website as well as her page on the Nebraska Arts Council website.